France bounced back from their heavy defeat at the hands of England last weekend, putting Italy to the sword with a 50-8 win at the Stadio Flaminio in Rome. France ran in seven tries in the Roman sun relieving some of the pressure on their head coach Marc Lievremont, who made four changes in personnel for the game. Damien Traille and Florian Fritz returned behind the scrum while Julien Bonnaire and Fabien Barcella were back in the pack. Sebastien Chabal reverted to the second row after his failed experiment as a flanker last weekend, and Frederic Michalak - now reinvented as a scrum-half - was on the bench after being called up by France on Monday for the first time since 2007. Italy, who failed to avoid a fourth Six Nations whitewash since joining the competition in 2000, kept faith with the starting team that ran Wales so close here in Rome last weekend. France started superbly, with scrum-half Morgan Parra pulling the strings in a quick-paced opening. He slotted a penalty to give his side the lead after the Italian pack ran into uncharacteristic difficulties at the scrum and doubled the French lead with an excellent second kick in a swirling wind. Italy grew into the contest slowly with Andrea Marcato reducing their arrears to three points with a penalty before the first of two grandstand moments from the French. Firstly, centre Yannick Jauzion pounced on a high ball on the Italian 22, the ball eventually finding Sebastien Chabal on the wing. The Sale monster steamrolled over Marcato's last-ditch tackle to score, with Parra then slotting a beautiful conversion from the touchline. France waited only minutes for their next score. Fly-half Francois Trinh-Duc slashed through the Italian lines after first-phase lineout ball, his original dummy followed by a sublime step and the pace to finish. Toulouse flyer Maxime Medard was also soon in on the act. He pounced on more poor positioning from Italian scrum-half Paul Griffen, feeding Trinh-Duc who in turn found Thierry Dusautoir. 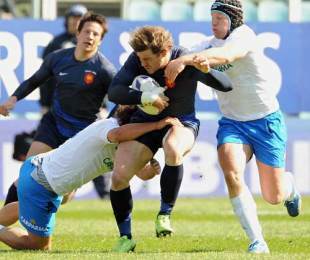 The flanker powered through a gap before returning the ball to Medard for France's third try. Italy made the worst possible start to the second half, with openside Mauro Bergamasco producing a horror interception for Cedric Heymans to score France's fourth try and open up a 29 point lead. Italy looked to have arrested the French tide with a purposeful set of phases metres from the France line, their forwards edging forward before fly-half Luke McLean wasted their good work with an aimless grubber. Parra added insult to injury with another penalty minutes later. Following a breathless passage of play both sides exchanged breaks before France centre Florian Fritz looked to have scored in the corner. After latching on to a grubber Fritz crashed over, only for a last-ditch dive from Sergio Parisse to force him into touch. France did not have to wait much longer for their next try, prop Thomas Domingo completing a surge from the forwards by placing the ball over the line from all of six inches out. After replacement scrum-half Michalak had missed the conversion it was Italy's turn to produce the goods. A chip from Marcato was followed by a surge from Bergamasco, who fed Parisse for one of the most richly deserved tries in recent memory. He did not have long to savour the moment, with France immediately ramping up the pressure on a tiring Italian defence. Following a myriad of punishing phases the Italians escaped with a penalty, but their relief lasted only a moment before a flash of brilliance from Michalak. Following a great step and powerful surge from Mathieu Bastareaud Michalak popped a pass over his shoulder to release Medard for another score. It fell to replacement wing Julien Malzieu to rack up France's seventh try, bursting down the blindside following a quick turnover and sealing a stunning win from the resurgent French. Italy: Marcato; Rubini, Canale, Mi Bergamasco, Pratichetti; McLean, Griffen; Parisse, Ma Bergamasco, Zanni, Bortolami, Dellape, Nieto, Ghiraldini, Perugini. Replacements: Quartaroli for Pratichetti (48), Orquera for McLean (72), Canavosio for Griffen (66), Sole for Bortolami (68), Del Fava for Dellape (54), Castrogiovanni for Nieto (58). Not Used: Sbaraglini. France: Traille; Medard, Fritz, Jauzion, Heymans; Trinh-Duc, Parra; Harinordoquy, Bonnaire, Dusautoir, Chabal, Nallet, Marconnet, Szarzewski, Barcella. Replacements: Bastareaud for Fritz (60), Malzieu for Heymans (71), Michalak for Parra (52), Picamoles for Harinordoquy (63), Thion for Nallet (71), Domingo for Marconnet (50), Servat for Szarzewski (52).